Story: Cleveland Heep (Paul Giamatti) has been quietly trying to disappear among the burned-out lightbulbs and broken appliances of the Cove apartment complex. 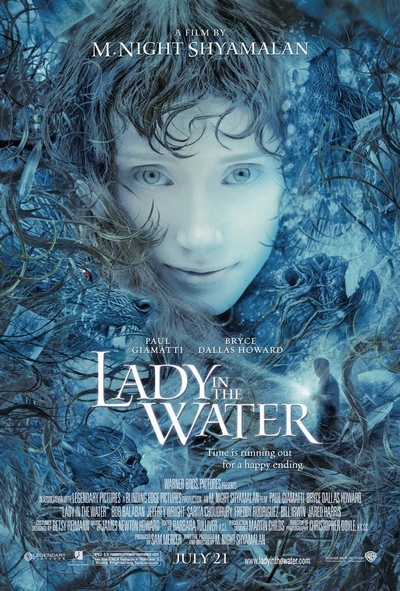 But on the night that irrevocably changes his life, Cleveland finds someone else hiding in the mundane routine of the modest building - a mysterious young woman named Story (Bryce Dallas Howard), who has been living in the passageways beneath the building's swimming pool. Cleveland discovers that Story is actually a 'narf' - a nymph-like character from an epic bedtime story who is being stalked by vicious creatures determined to prevent her from making the treacherous journey from our world back to hers. Story's unique powers of perception reveal the fates of Cleveland's fellow tenants, whose destinies are tied directly to her own, and they must work together to decipher a series of codes that will unlock the pathway to her freedom. But the window of opportunity for Story to return home is closing rapidly, and the tenants are putting their own lives at great risk to help her. Cleveland will have to face the demons that have followed him to the Cove - and the other tenants must seize the special powers that Story has brought out in them - if they hope to succeed in their daring and dangerous quest to save her world...and ours.